Sean F. Miller was was arrested Sunday morning by officers of the Wilbur Francis Command and charged with second-degree assault/domestic violence, the V.I. Police Department reported. According to police, at 9:28 a.m. Saturday, officers from the Wilbur Francis Command police station responded to a reported domestic disturbance at the Walter I. M. Hodge Pavilion in Frederiksted. At the scene officers met with the female victim, who said a male acquaintance strangled her and assaulted her. At 11:10 a.m. Sunday officers arrested the 26-year-old Miller was arrested and charged with second-degree assault/domestic violence. 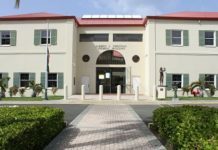 As required by the domestic violence law, no bail was granted for Miller; he was remanded to the Golden Grove Detention Facility.